I've had this idea for a new series of small paintings for a while now, and this is the first one. The idea is to use my Facebook friends profile photos as the source for the imagery and make small paintings from them, which I will post to Facebook as I do them. I felt I should start out with someone who's face I know well, and who better than my own mother? One of the objectives of this excercise is to see if I can paint from photographs. It is, I guess, my way of facing up to that perennial debate that a lot of artists have, over whether to use photographs, rather than painting directly from life. 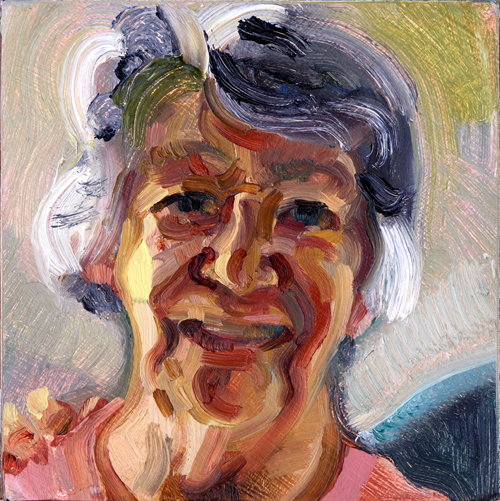 I have used photographs many times before of course, however, for the last decade or so, I have been quite rigorously painting my subjects directly from life. The predominant genre I have been painting recently has been still life which is ideally suited to working from life. I can set up the subject and stare at it for hours on end usually. Flowers are always a bit of a problem, and I have watched fresh pieces of fruit literally decay before my eyes, over the days and weeks a painting may be in progress. Visual imagery is cheap and disposable. In some ways perhaps this is a good thing. Art has certainly lost much of it's former preciousness. I will probably feel quite differently about this on another day, but right now, this seems like an avenue worth exploring. That's a lovely portrait, looking at it again, definitely not a robot! here. You are definitely not a robot Julie! Thank you for your kind words. I've been feeling a bit down so it helps.